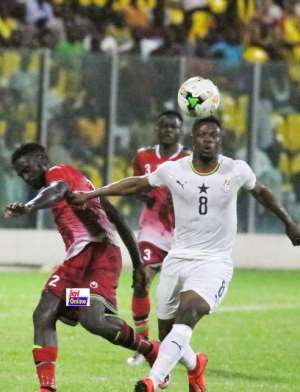 Leeds United loanee, Caleb Ekuban is delighted after climbing off the bench to score on his debut for Ghana in their 1-0 win over Kenya in 2019 Africa Cup of Nations qualifier in Accra on Saturday. The 25-year-old to score the only goal as the Black Stars finished qualifiers as Group F winners, two points above Kenya. Ekuban hit a first-time left-footed shot from just inside the box, the effort proving too strong for goalkeeper Matasi. “It's quite amazing. The first thing, as a striker, you want to do is to score so when you get the opportunity and you score it feels like it is not even real. I am really happy,” Ekuban said at the post-match press conference. Ekuban is one of five debutants invited for the match by Kwesi Appiah. Finishing top of the group means Ghana will be seeded and the possibility of a decent group in the tournament.